This is a short, yet pretty concise and important posting reflecting the truth that what we see is by far not all that exists. This is also for making people aware that when Mohanji gives someone a card, it is not just giving a card. It is like giving a passport to reach him. It is also an assurance of protection. Every card is alive and radiates energy. 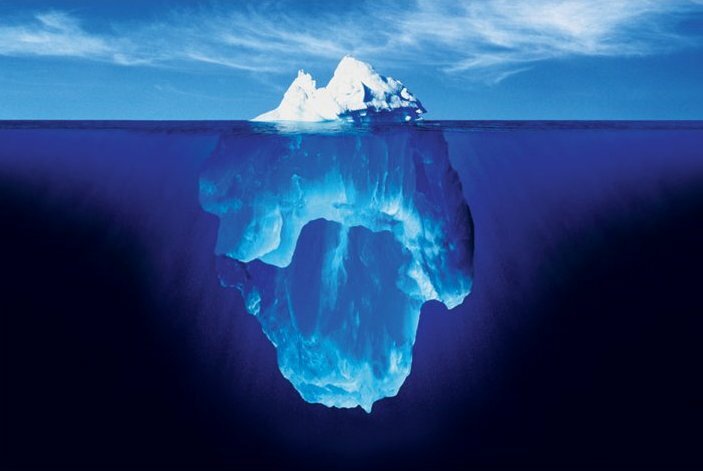 This blog post is intended to make people aware that what they see is only the tip of the iceberg. There is much more energy mass hidden. And it takes patience and time, faith and purity to taste the divine energy. This friend is someone we could call spiritual and connected to God. She also came to the BTW meditation with Mohanji in Hamburg in April this year. 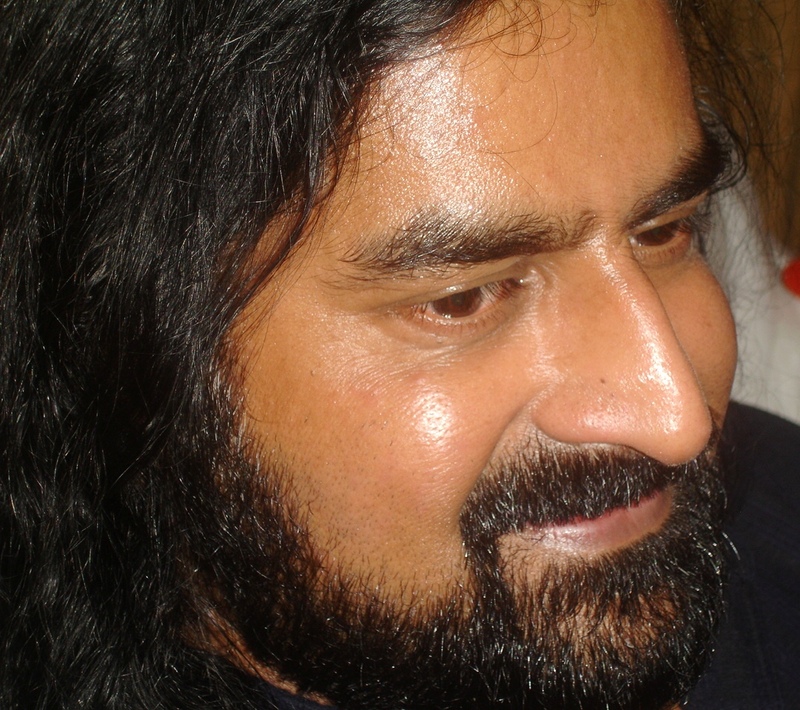 Given her experience with Mohanji she was “convinced” of his purity, however back at home and looking at his spiritual card and – what she called – “dark” photo of him, she got doubts. In fact, she felt so uncomfortable looking at Mohanji’s photo on the card, that she wanted to get rid of it. She did not want to just throw it away though. She was searching for a “respectful” way of disposal. In this search she carried the card around backwards and forwards, sometimes left it somewhere, forgot about it, and then the card popped up again, fell into her lap, appeared in her bathroom etc. A couple of weeks ago she was fed up with not finding the right mode to get rid of the card and with the fact that it kept on appearing and continued to make her somehow nervous. So she decided to dispose it with the weekly paper recycling service (there is a paper collection service for each household run by the German government). She took her pile of old papers and dropped Mohanji’s spiritual card in there, wrapped it and left it in the street in front of her house ready for the collection. So the batch got picked up. Few days later she gave the pedestrian area a sweep. Amongst the autumn leaves, dust and pebbles, she noticed a piece of paper. She bent down to have a look – and here we go: Mohanji’s spiritual card was back in her hands! Despite the rain , autumn wind and god knows what, the card was still fairly intact. And now she understood and resistance melted. And guess where she keeps this card placed these days? In the drawer of her bedside table! This story really brought tears to my eyes. I’m so happy she understood something about Mohanji here. And I am again impressed and humbled by the divine choreography. No more to say at this point. Dr. Deepali: At the outset, let me sincerely thank Rajeshwari for almost single-handedly organizing the Thane-Mumbai BTW event on 21-22 Oct 2010. This Mumbai trip was not only relevant in terms of the two meditations that were conducted, but it was also a BTW family’s multinational gathering which happened for the first time at this scale…. Marina came from Germany, Babu flew from Bangkok, his parents and uncle-aunty came from Chennai, Kim Anh from Vietnam, Mohanji, Sudeep, myself and Moushami from Muscat, Mohanish from Pune, and Rajeshwari was there to welcome all of us! 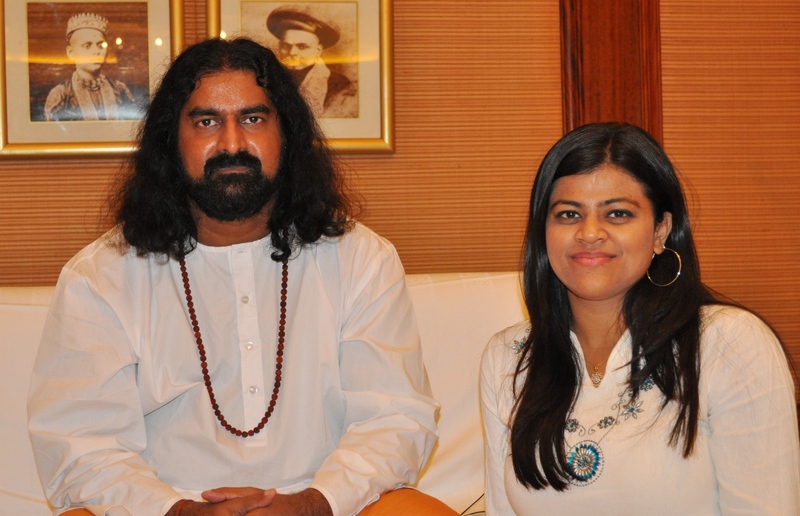 Rajeshwari: Mohanji’s recent visit to Mumbai was one of the biggest blessings of my life. On one side it was a moment I was so looking forward to, while on the other, I realized I had very few moments to bask in the bliss of his presence as there was so much to be done/coordinated and time was really too less, for it was not just Mohanji but my large BTW family which was coming along and most of them were coming to Thane for the first time. This made it even more important for me to ensure that everybody felt at home and were well looked after. That day early morning, exactly when Mahavatar Babaji’s Arati was playing, Mohanji walked into my home. Tears of happiness welled up as I hugged him, just like a child who has been waiting for a long time to meet her beloved father. It was as if I had arrived Home….. 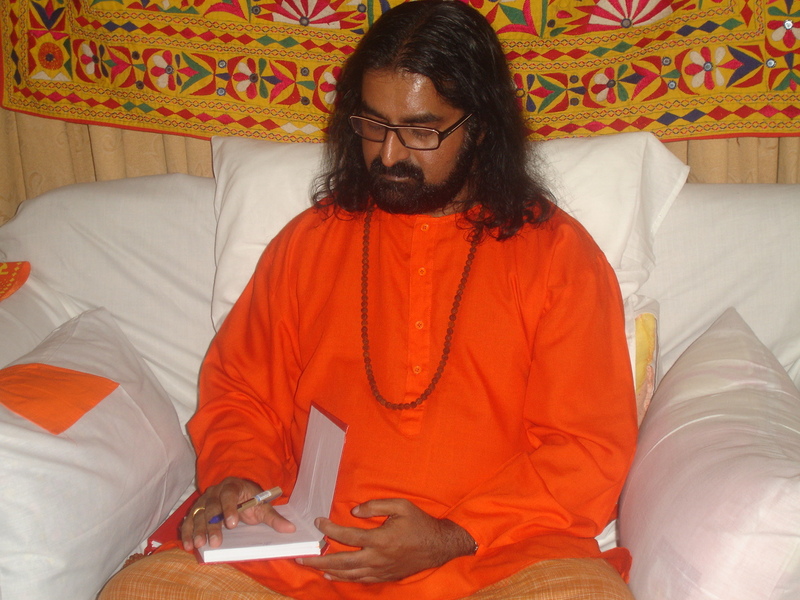 The meditations were slated for 21st evening in Thane, and 22nd evening in Parel area of Mumbai. 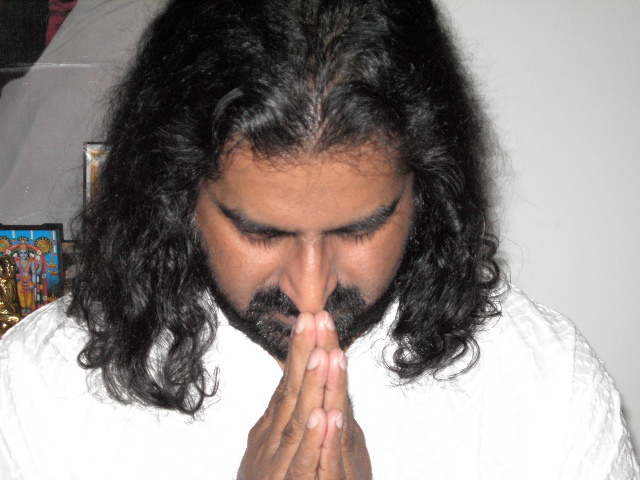 As Mohanji always says, magic of BTW is not in the words of the meditation but in the Grace of the Masters who shower their blessings on us and take us at least one level up during every meditation – and hence, each mediation is unique. That is indeed what we have witnessed this time as well!! 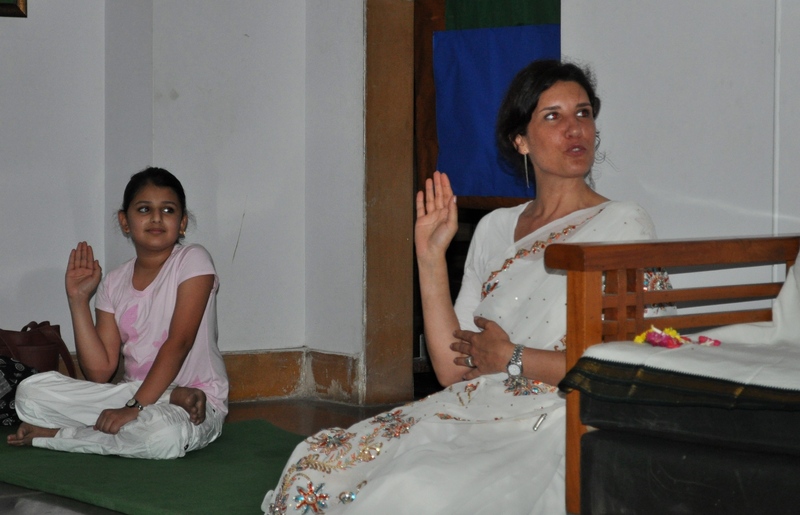 Dr. Deepali: Our meditation venue, Hiranandani school hall, was almost full and meditation went very well. At the end, when we started Shirdi Sai Baba’s Arati, I clearly saw deep blue-purple light coming out from Mohanji’s back and surrounding and embracing the full hall. It was certainly the presence of the Masters and Mohanji’s grace. This was the first time I saw this energy /light with my own eyes. I felt deep gratitude towards Mohanji for giving this experience of direct presence of Masters, through him, to all of us. Many of attendees were very receptive to the energy during Shaktipat. But few had very active analytical mind which was resisting the energy flow. Their being was thirsty for the energy experience, but body was not ready as mind was preventing it. Mohanji has infinite store of energy. But if we do not bring empty pots, how can we receive/collect the divine energy? Human mind is skeptical since ages, but it is time to change and accept the grace. I would like to mention an observation. In spite of sincere request by Rajeshwari, many mobile phones were on and kept on vibratory mode. The ringing/vibration of mobile phones was disturbing the CD player sound and the meditators. 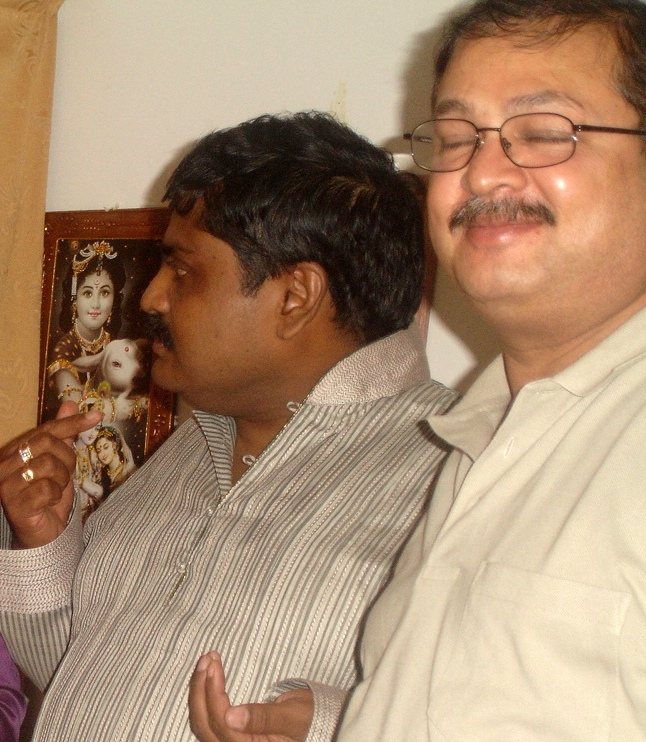 We found that it was disturbing Mohanji too, who was in a highly expanded state. During deep silence, as we dive into subtler and subtler layers of existence, this disturbance could give huge jerk to the meditators and may even harm the person! We are experiencing the grace, can we not be in total silence and simply connect with our souls? Why should we allow external factors to disturb our inner peace? One young man was driving his motor bike on the road next to the meditation venue. Suddenly he received a telepathic message from Shirdi Sai Baba: “If you want to see me, come inside. I’m here!” Without second a thought, he pulled the bike into the compound, parked it, and walked into the hall. He entered almost by the end of the meditation. He clearly felt and saw Sai Baba instead of Mohanji. As a reconfirmation, after a few minutes, he heard Shirdi Sai Baba’s Arati which was played after the meditation – he could no longer control the tears… He came to Mohanji, touched his feet, and conveyed this whole miracle. Interestingly enough, he had never heard of Mohanji before nor did he know that this meditation will be happening at Hiranandani school. 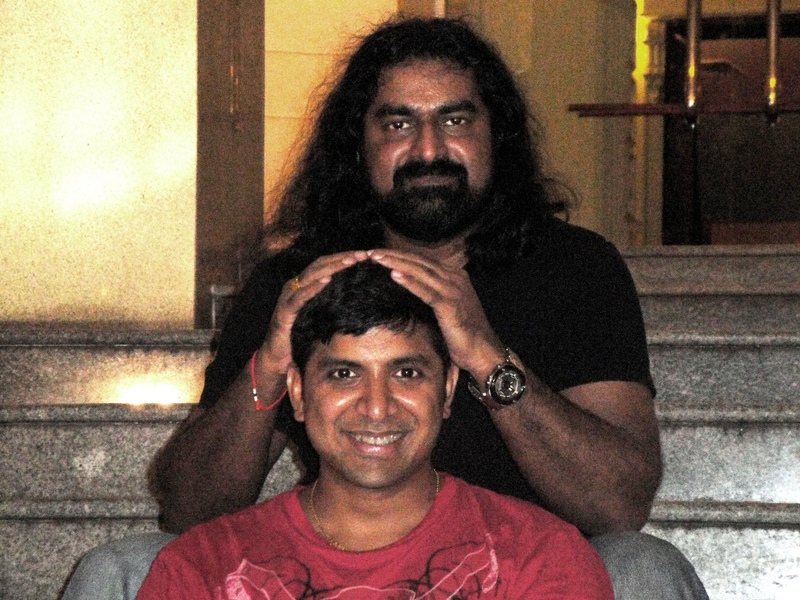 Sumeet was another person who experienced Sai Baba that evening. When he found out about Mohanji’s arrival to Mumbai, he could not resist himself and came all the way from Jammu to meet Mohanji and attend this meditation, during which he experienced Sai Baba embracing him and was deeply touched. These were only some of the many experiences. 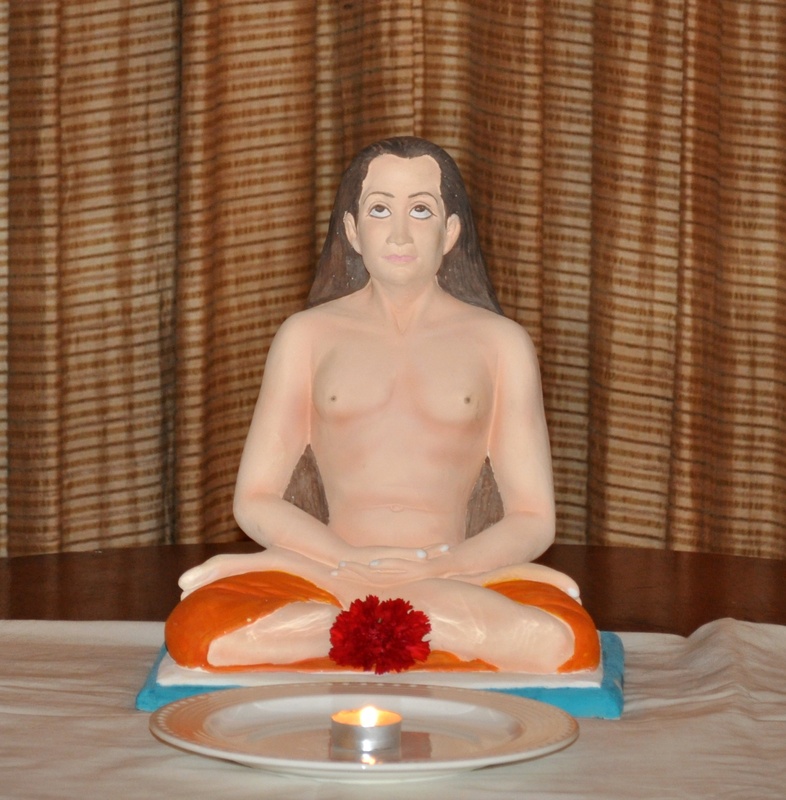 Rajeshwari: As we arrived to the venue and were getting ready, one of the participants – Hima (this name has been given to him by Mahavatar Babaji to whom he is greatly devoted) arrived with a beautiful Babaji moorti (idol), his own work of art and devotion, which he was guided by Babaji to gift to Mohanji. This was indeed most unexpected. And there I was, holding it in my hands and clearly feeling that this was not just a statue, but the grace of BABAJI that arrived. I unwrapped the cover and had quivers all through, as I witnessed him radiating his unmistakable glow and infinite grace on all of us. 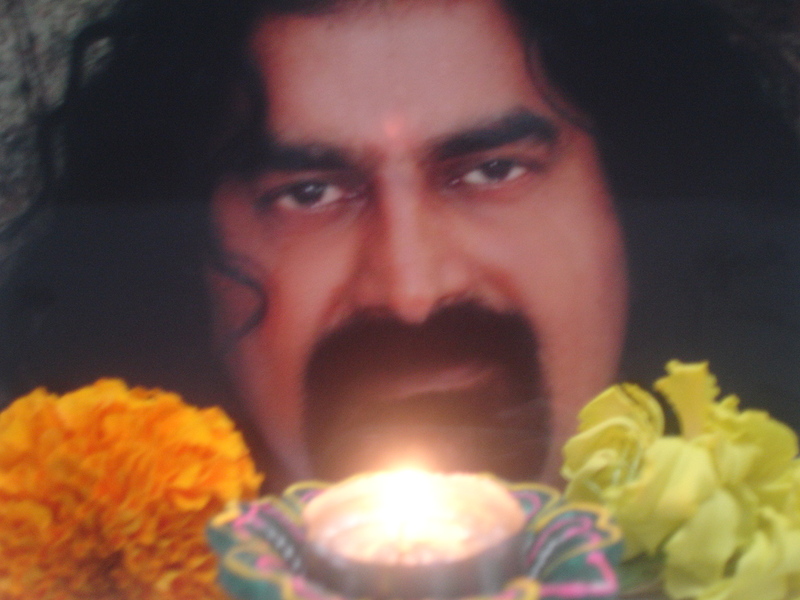 In fact, after the meditation, Hima said: “When you gave me Shaktipat, I saw a golden Shivalinga in my third eye”. Hearing the experiences of people always reinforces the huge responsibility and blessing that those of us who got initiated into Shaktipat have been endowed with by Mohanji. My humble gratitude to Mohanji and all my BTW family for giving me this opportunity to add a selfless chapter to my life. May the Grace always shine upon us! Marina: On both evenings, before we started giving Shaktipat, Mohanji blessed us, Shaktipat initiates, first. 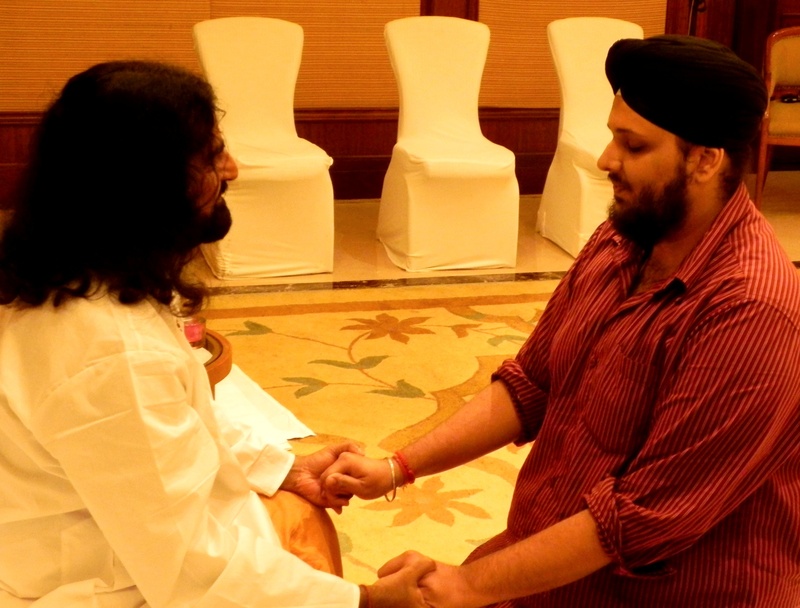 So also before the second session at the ITC, I was called to sit in front of him, and the Shaktipat I got through Mohanji that evening was just out of this world! The “I” or “me” completely dissolved! I don’t know how to describe it any better, but I became Mohanji. As bold as it might sound, I felt his essence moved into my body and being. He completely melted into my cells. 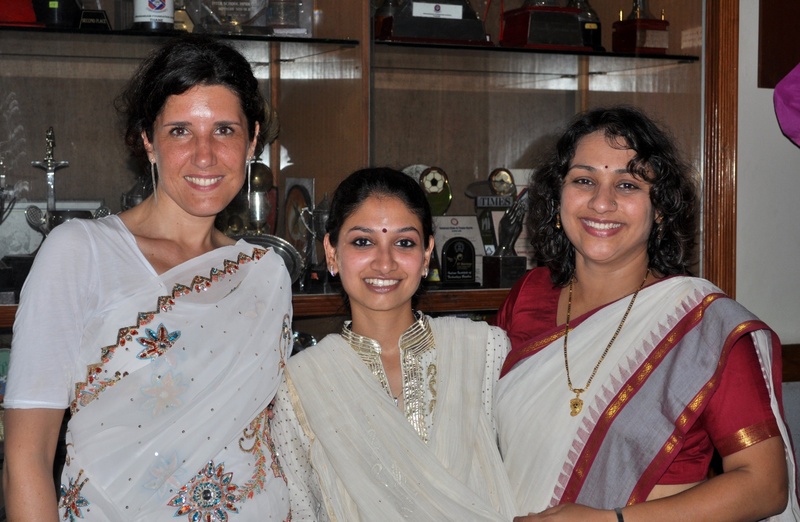 Marina, Rajeshwari & Dr. Deepali - the Radiance! Moreover, Sumeet had a surprise awaiting him – he wanted to meet his friend Abhishek from Delhi who introduced him to Mohanji and his web site – but never expected that he would meet Abhishek in Mumbai! 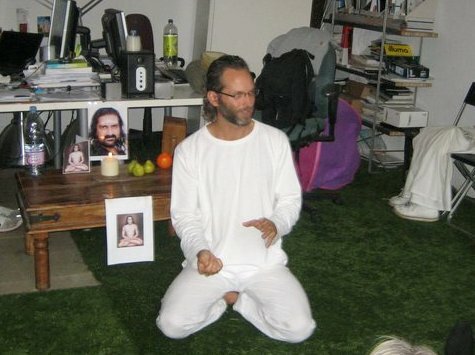 One other man said that he was fully guided by Babaji to reach here for this meditation. He also did not hear about Mohanji until that morning. How beautiful! Later we realized that, many were automatically guided to attend this meditation. The experiences and miracles that we share with our friends do initiate someone to get connected with the Masters. All is the leela of the Masters. Those who attend meditation are all sent by Masters. Mohanji always mentioned that –Masters happen, at the right time, to those who deserve their blessing. I was high on energy, floating in lightness as well as moving full steam. In front of me the plate with food. Delicious raw vegetables. While popping a piece into my mouth I have this flash of puzzlement. What am I doing? Why am I feeding this body? This mass of energy. What’s the point in eating, putting food into this body? There is no form. There is no body! There is no direction. There is just infinite space. I have the impression that food could easily drop to the floor if I place it in my mouth. Something is here, but it seems just some kind of cloud, maybe a conglomerate of denser energy where the “I” thinks it is located. Why eating? Why talking? 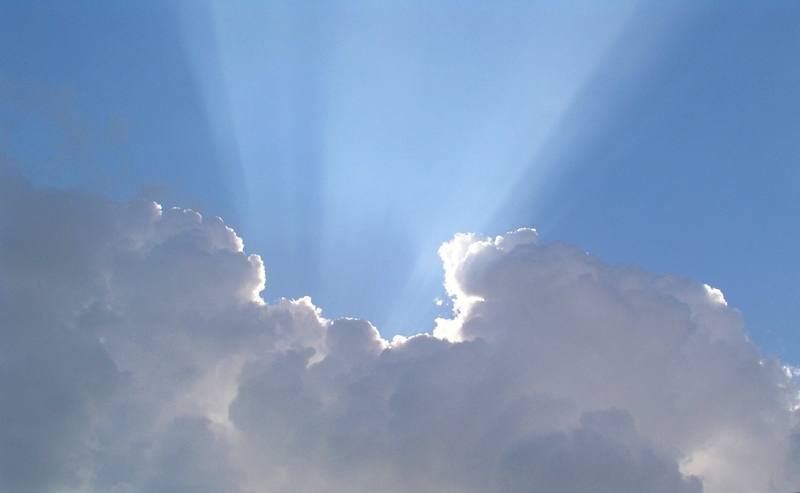 And still, something in this cloud is breathing, looking, laughing, talking… What is it that is existing? Just presence and silence! Presence that is laughing, looking, loving. 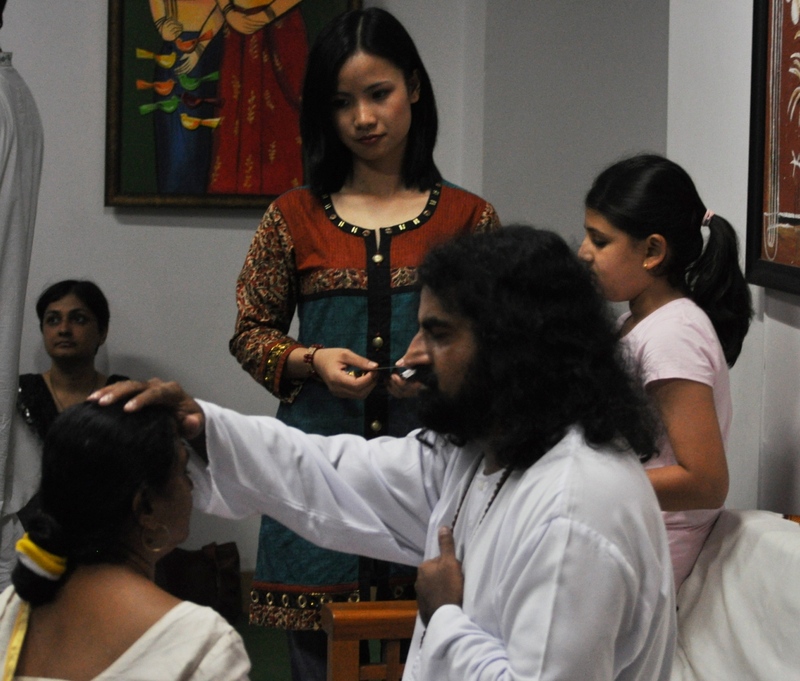 Dr. Deepali: Many who attended the meditation in ITC gave donation for Ammucare. But what really touched me was the way they gave donation – they gave whatever came to their hands from their pocket. BTW group expresses deep gratitude to ITC Group for offering their hall for this event; sincere thanks to the General Manager Mr. Kuldeep, all those who manned audio/PA system, and the catering personnel in ITC. Moreover, sincere appreciation to Hiranandani School for making their hall available for this event. And finally, BTW family offers special gratitude to all those who contributed for the upcoming Ammucare Blanket Distribution charity events in the slums of Delhi, scheduled for Nov 9th and 14th , 2010 – a wonderful opportunity to experience the Grace…. As you know viewing a website on a phone is very different from viewing it on a PC, so the website has been tailored to display in a user friendly manner in a mobile browser. It has been tested on several devices including iphone, ipad, ipod touch, Nokia, Palm and Windows Phone. The site uses technologies that are recognized by most mobile browsers and should work for most phones. Do try it out and report any feedback on how we can improve it in the future. 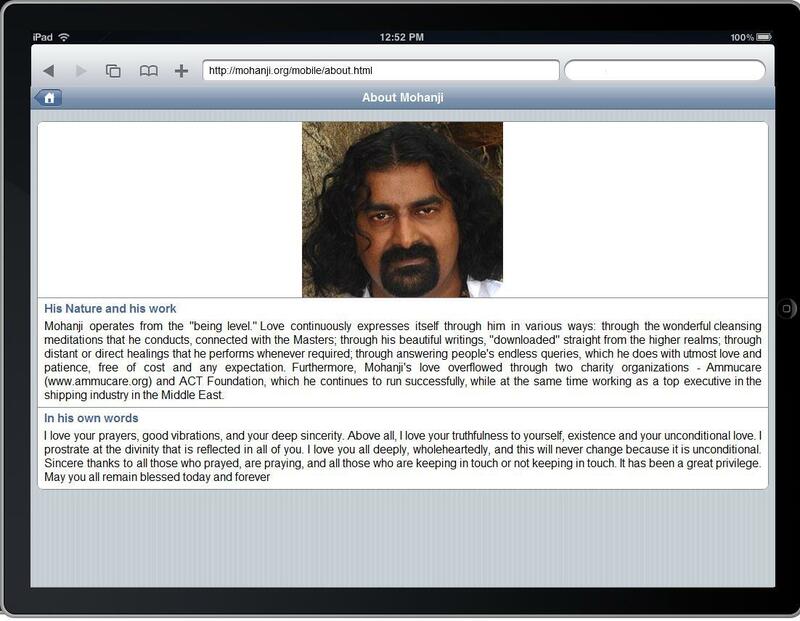 Give it a try by going to http://www.mohanji.org from your mobile phone and you should be redirected to the new site. 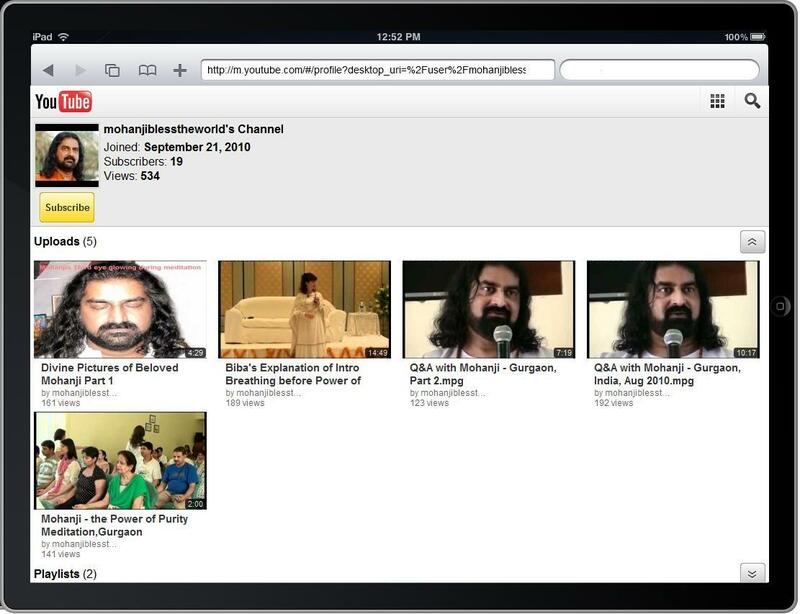 Note: If you are accessing mohanji.org from your computer, you should still see the existing site. Only mobile devices will be redirected to the mobile version of the site. If you have any questions/require any clarification or guidance, please ask in the Comments section of this blog, and I will answer accordingly. 10-10-10 was indeed a special day – not only numerologically, but also energy-wise. It marked an important shift in our vibratory level, in preparation for 2012. 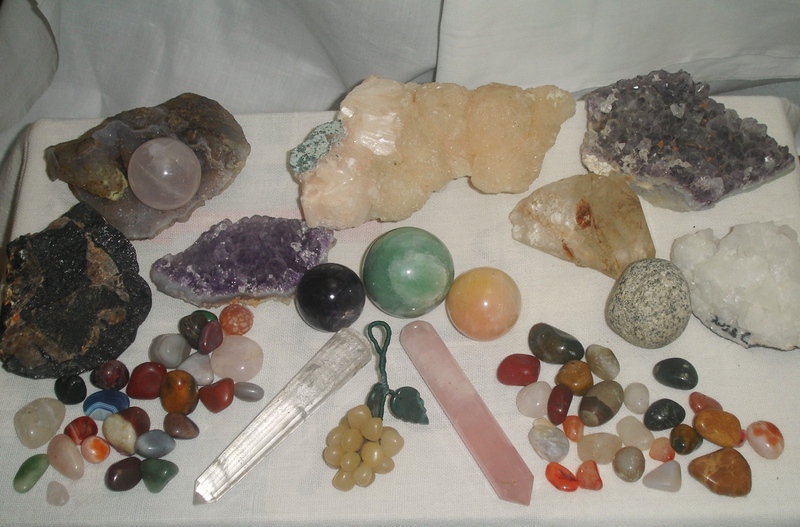 These energies had a beautiful effect at the subtler layers of our being, a beautiful effect on the crystals, and our Mother Earth as a whole. 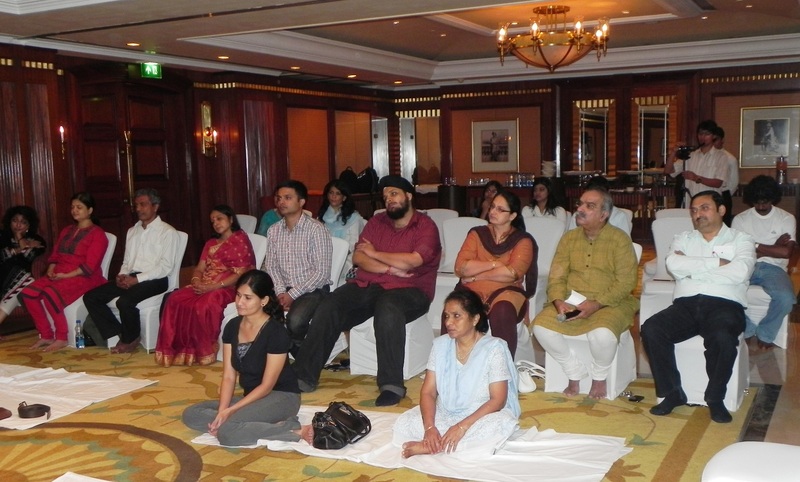 Those of us in Muscat had a wonderful opportunity to enjoy a special meditation with Mohanji, and those who were physically away but at the same time connected with Mohanji energy-wise, through meditation, also had a stunning experience. In fact, whoever was connecting with Mohanji at that time felt tremendous energy/heat (we received several testimonials from different countries, shared below). It is amazing to witness this grand connectivity! Even during the day itself, while at work, Sudeep and I both felt a strange pressure on the third eye, bordering with headache. 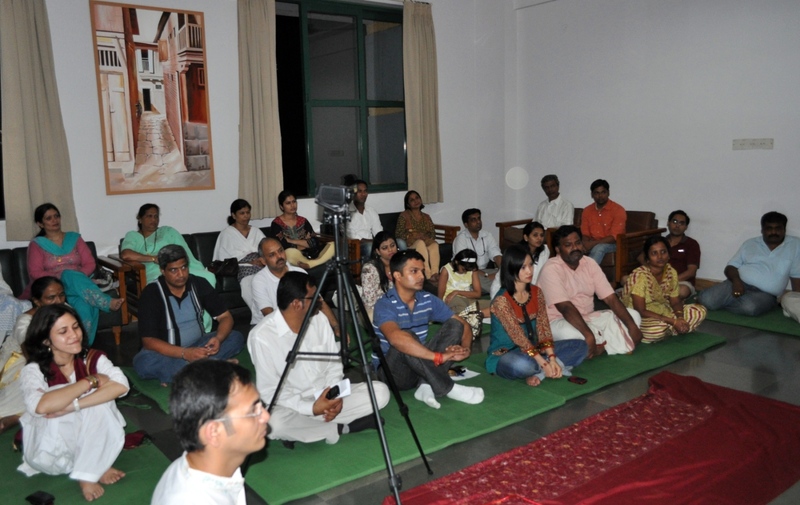 Meditation in the evening was a big surprize – it was completely improvised for the occassion by Mohanji. Multiple Masters entered him and our individual energy fields underwent all kinds of different sensations and energy jolts. As per Mohanji’s guidance, we simply chanted Om continuously and with varying intensity, focusing on different chakras – starting with Sahasrara. Meditation itself may sound simple, but it had a great power. When we reached the throat chakra and chanted OM, at one point Mohanji said we should chant HUM with force, while breathing out. We were following Mohanji’s HUM chanting which was like a higher command. That created a powerful effect, as if some gigantic force was activated in the inner space. I could feel the top of my head tinkling very much, at times so much that I barely resisted not scratching my head – I knew that tinkle very well and recognized the presence of Masters… (As Mohanji explains, Sahasrara (crown chakra) represents the Supreme God or Parabrahma – if the tinkling happens there, it thus represents the highest). Love and gratitude kept me at the edge of tears continuously. Experience of MF: Among all of us present around Mohanji that day, MF’s experience stands out as truly special. Visibly overwhelmed, as soon as the meditation was over, MF prostrated at Mohanji’s feet with deep reverence. He was so sweet while trying to convey the magnitude of his experience in limited words. MF said that during meditation, while chanting OM with focus on throat chakra, his head suddenly became heavy and body got paralyzed/frozen (i.e. he experienced a high energy expansion, a trance state). During the intense HUM chanting, he felt as if his body became completely empty & inner space was “fully filled with something.” He then understood that it was the enery of Shirdi Baba that entered him! While in that state, he could make out that Baba is asking him something, but he was unable to understand exactly what, so he didn’t answer. He also felt that Baba touched the centre of his chest & stomach. 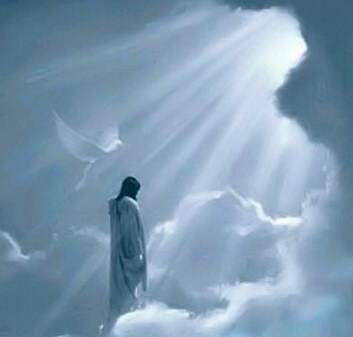 At that point, his body became cold and he was shivering & vibrating, overwhelmed with deep reverence. He was still feeling the heaviness of energy even one hour after the experience. We understood how great the blessing that he received really was and felt so happy for him – his purity and continuous, sincere Seva to Mohanji brought this experience to our dear MF. I would also like to mention that just a week before this meditation, MF had the incredible blessing of meeting Shirdi Sai Baba in person. He appeared to MF in a form of a beggar, just near the Post Office. MF was about to enter the Post Office, when this ‘beggar’ told him in commanding voice: “Give me some water.” MF was rather confused and, worried that the Post Office may close, went inside to drop one parcel. He came out fast, with intention to bring water to this man, but he disappeared. MF looked around, but the unusal man was nowhere to be found. When he shared this experience with Mohanji and me, we knew right away who that was, and told MF that he has no idea how great of a blessing that was. 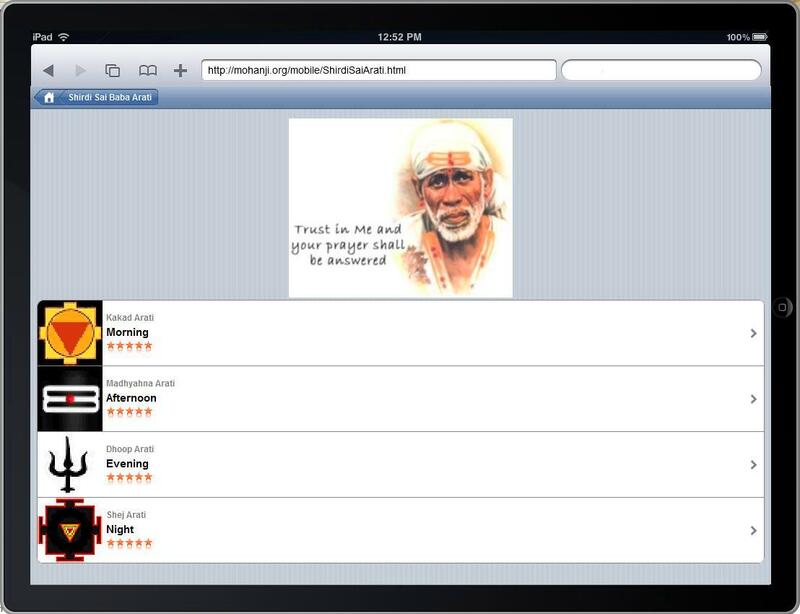 He actually met Shirdi Sai Baba in person!!! MF was quite dazzled with our reaction and then started feeling bad that he didn’t go get the water immediately, but went to the Post Office instead. During this meditation, Baba reconfirmed his blessing to MF through this intense experience and he was completely overwhelmed. After Mohanji blessed and gifted these 3 Satcharitas, we continued with our experience sharing. 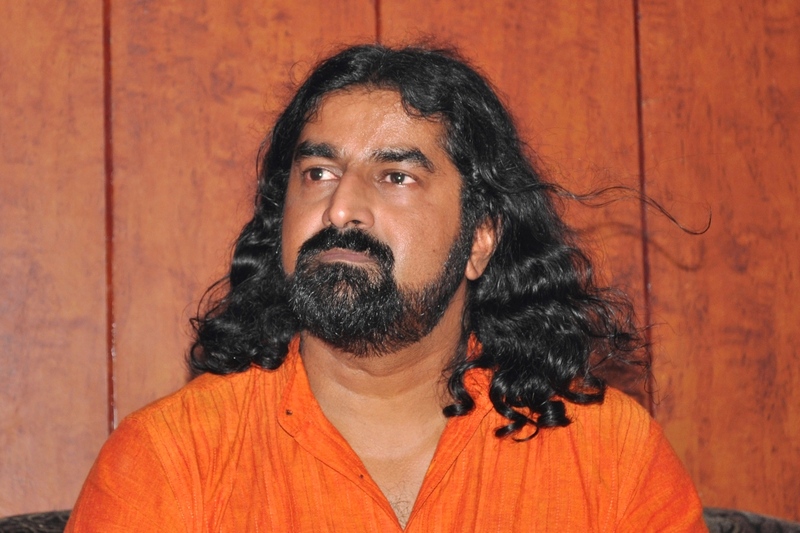 Sudeep said: “The moment Mohanji entered the room that evening, I could feel the energy oozing out of him and noticed the sharp, Shaivic expression in his eyes. His Presence was so powerful that immediately everyone fell into deep silence. During the meditation, I felt the presence of the Masters – first it was Lord Jesus, then Mahavatar Babaji and then, most clearly, Shirdi Baba whom I felt/saw standing right in front of me and then moving through the room. 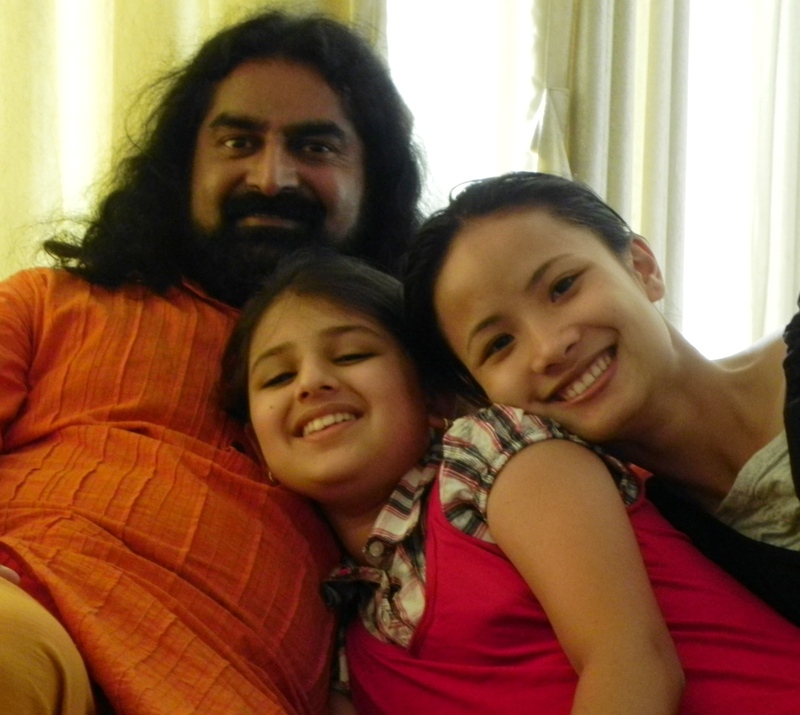 After the meditation, during the Arati, I felt the presence of Bade Baba which melted my heart. Experience was that of total, absolute stillness! “Already in the morning meditation (10:10am my local time) I felt a very dense and intense energy rushing through me & could feel my third eye very strongly. 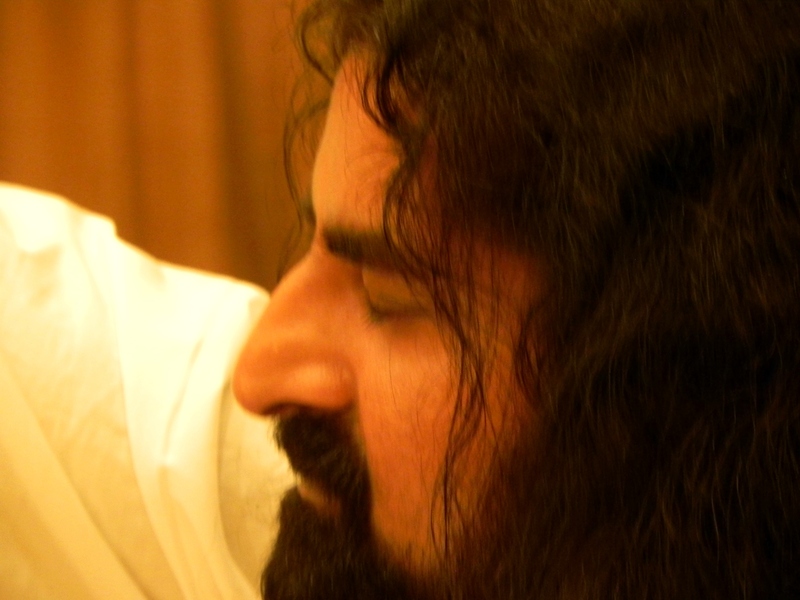 But in the afternoon, when I joined Mohanji’s meditation at 7:30 pm Muscat time I was literally knocked out! I felt a huge shift happening and a rush of heat coming into me -my skin felt like electricity was flowing through it. I then had to lie down on my back because I was so dizzy and overwhelmed! It was amazing! I was electrified the whole rest of the day, hot like a radiator, even while on my way to our local BTW meditation with Shaktipat: in the tube, walking to the venue, during the Shaktipat – it was so intense! When the intro breathing before BTW started and we chanted AUM, it was like somebody else was chanting through me! Everybody else could also feel that the energy was so extremely dense that day during our Shaktipat – I could still feel the energy flow even the next morning.” After sharing this with Mohanji, he told me that Fabian’s connectivity with him has increased manifold. This is in proportion to one’s complete faith and surrender. “During 10th Oct, I was in Ho Chi Minh city. Actually I was not able to join the meditation on that day because it was raining heavily. On that evening around 7PM, I suddenly got a severe headache. I tried to reduce it with medicine, pain balm and head massage, but nothing worked. I noticed that the headache was very different and distinct, as if something was shifting within my head. I slept somehow that night, and next day morning was my travel back to Bangkok. To my great surprise, I was able to wake up without any alarm in early morning and there was no symptoms of headache – totally relaxed and feeling very fresh! Later on, when I spoke to Mohanji , I came to understand that he was “working on me” -:). I was very much excited and the level of happiness cannot be explained by words. “Dear all, just a little intro to give you an idea on how the day unfolded before my travel companion Abhishek and I got to the BTW & Shaktipat session in the evening of the 10.10.10. Midday on the 10.10., Abhishek and myself arrived in Haridwar. Having organized everything for a “proper” visit at the temple/samadhi of Lahiri Mahasaya (flowers, fruit, fragrance, sweets,…) we reached that Kriya Yoga ashram just in time for a contemplation and walk around the temple before the gates closed (!). We moved on to the Samadhi of Lahiri M and sat down for a meditation. The energy was so intense in that little room. I cannot recall having felt ever more clearly the energy rising along the spine up, kind of stopping by at each chakra. I felt and saw orange/yellow lava-like energy rising in a constant flow and embracing each chakra upwards like a bus at a busstop (sorry if that’s too much of a simplification, but hopefully it gives you the picture). To cut a potentially long story short, we moved on towards Rishikesh and checked in at the hotel (Divine Resort!) in Tapovan. 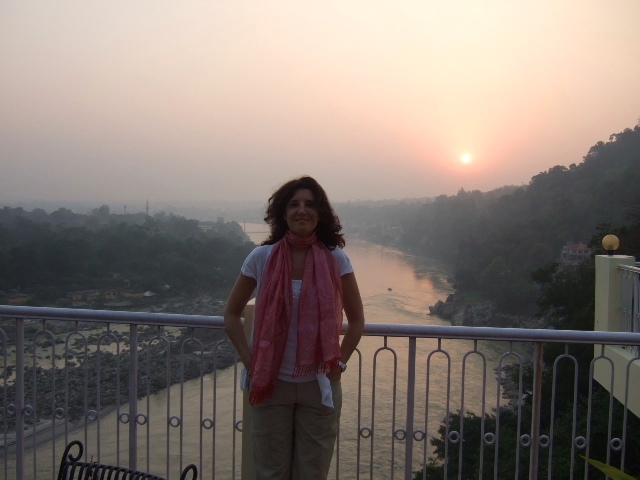 Sunset in the magnificent environment overlooking Ganga and the lower mountains of Himalaya – just so beautiful! 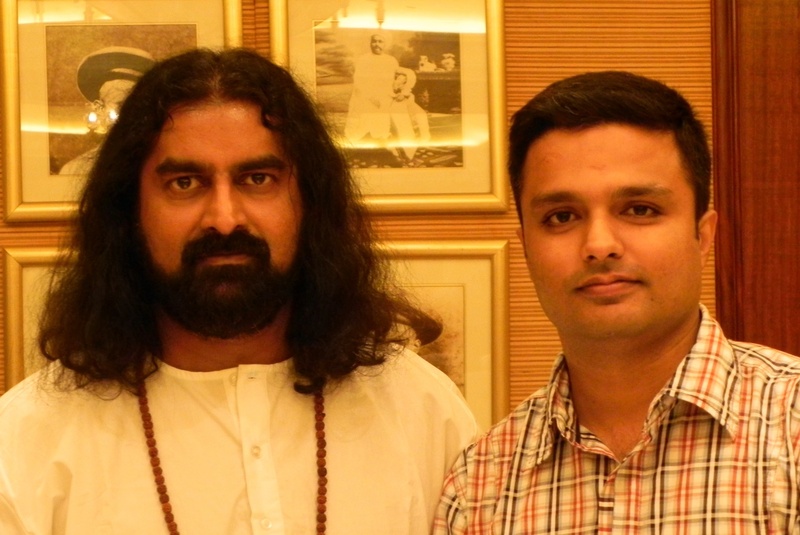 At 21:45, Abhishek and I sat down for the BTW mediation. 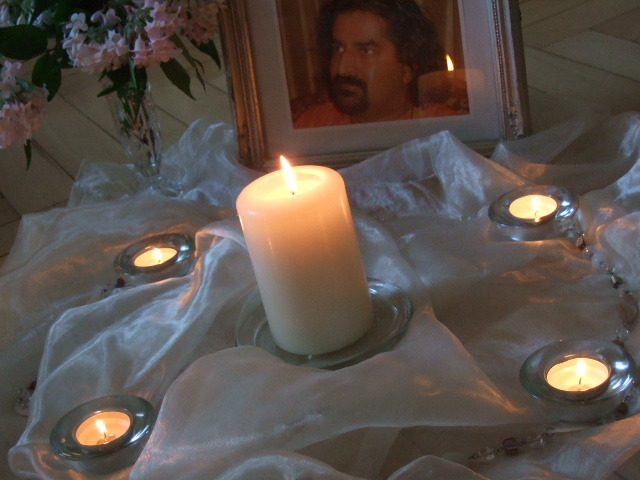 We knew that at the same time Mohanji was starting to conduct the meditation in Muscat. we had neither a stereo nor a laptop. I used my Ipod without headphones on max volume, so we could hear Mohanji’s voice at least, even if the sound was really “squeezed”. 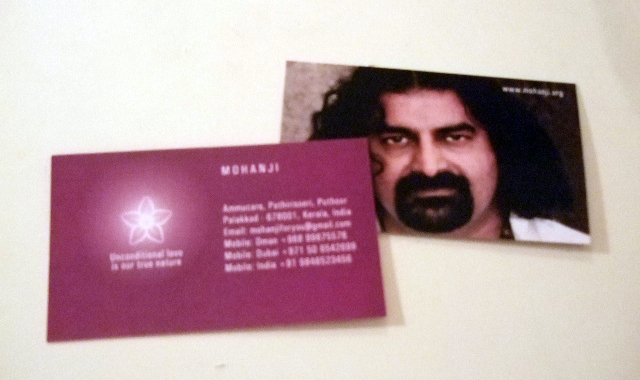 We got one tea light from the hotel reception and I retrieved out of my purse two of Mohanji’s spiritual cards. And off we went. Pranayama was pretty focusing and caused pleasant tingling in the cells of the back, shoulders, arms and hands. 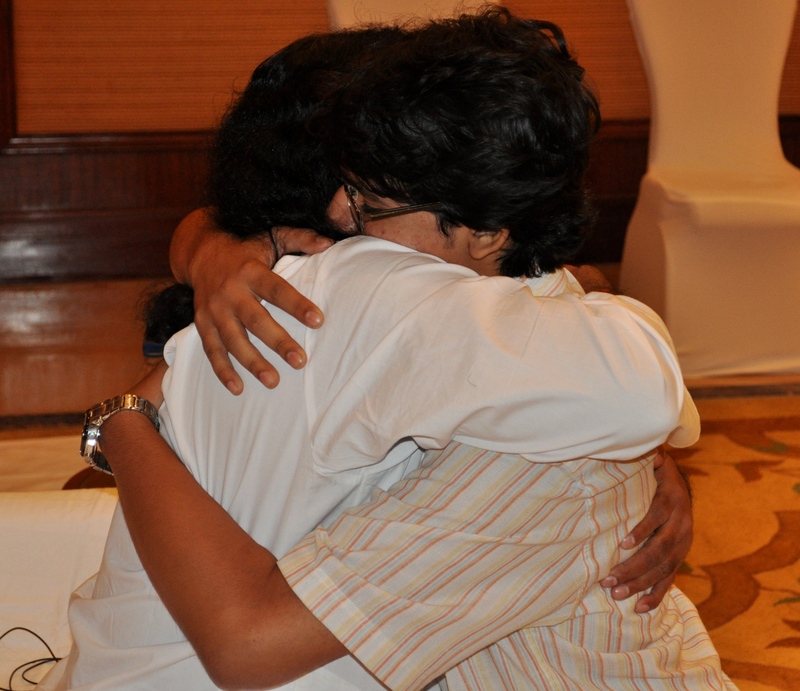 Energy rose almost in an instant and I gave Abhishek several Shaktipats of which each one felt completely different. During one Shaktipat round I could not even feel his head upon touch – it seemed like a mass of energy and I almost feared this body in front of me would dissolve completely! Mohanji is such a powerhouse of love and healing! Connecting to him, I felt that a massive shedding/burning of blockages was taking place in Abhishek. In fact, I thought the palms of my hands will get BURNED by all that energy flow during Shaktipat. “With the blessings of Mohanji, I got another chance to visit the mighty Himalayas after a one month gap, with my spiritual sister from Germany, Marina. It was a delight & pleasure to spend time with such a beautiful, evolved soul. 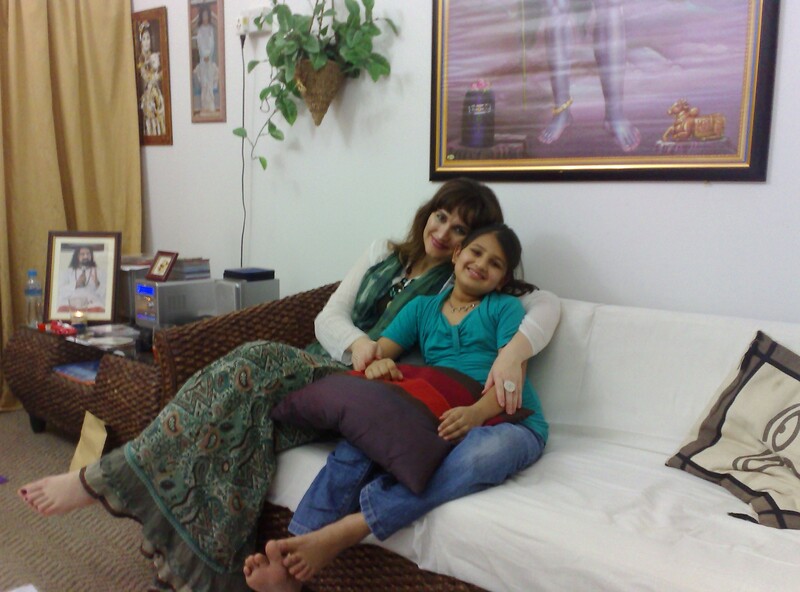 Marina is one of the closest disciples of Mohanji and one of the first to be initiated into Shaktipat by Mohanji. She is truly an embodiment of love & light. Mohanji - the Golden Glow from within!